When customers buy from you, they want it to be an enjoyable experience that’s well-worth their valuable time. That’s in addition to buying a great product or service, of course. Customer experience goes beyond standard, expected customer service. It means intuitively guiding customers through the buyer’s journey in a way that caters to their interests, needs, wants, concerns and questions. It’s knowing your customers on a deeper level and anticipating what they need and want from you without them even having to ask for it. With such an emphasis on enhancing the customer experience, companies can no longer depend solely on a great product. In fact, in Econsultancy’s B2B Digital Trends report companies stated the single most exciting opportunity for 2018 is customer experience (ahead of content marketing and mobile marketing). This transformation can’t be ignored as the tides shift, so we’re sharing five customer experience examples for B2B brands to get your marketing team headed in the right direction (you can also checkout our top customer experience examples for non B2B brands). Most of the time, consumers relate to well-known B2C brands over the (sometimes) less exciting B2B brands. We get it. Partner with well-known brands to bridge the B2C and B2B bridge. That’s exactly what Hewlett Packard Enterprise (HPE) did when they associated their brand with Paramount Pictures’ Star Trek to support their “Accelerating Next” campaign. This is a perfect example of how finding a collaboration that makes sense can increase visibility for your brand and enhance customer perception. A great customer experience is important, but taking it to the next level can make all the difference. Take Qumulo as an example. 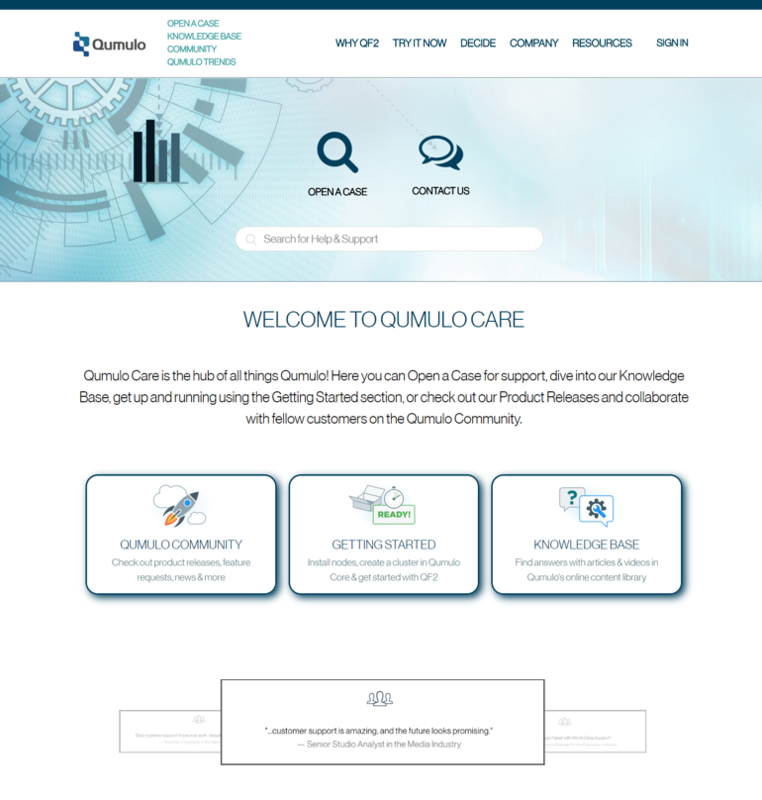 Qumulo, a provider of simple, scalable, and efficient enterprise data storage systems, listens to feedback and suggestions to give customers the experience they want. “You have to come with a modern customer experience approach that is able to evolve and adapt. Ask your customers what they want and then give it to them,” explains Chris Lisica, Director of Customer Success. One way they do this is through their Qumulo Care portal that gives customers easy access to important resources, a like-minded community, and the option to open a support case ticket. You could even take things a level further by “gamifying” your community – so community members who answer questions, provide feedback, or engage in your community get rewarded. When we think of brands creating an emotional connection with their customers, B2B companies aren’t first to come to mind. But, Motorola wanted to try something different – and they did. Motorola’s arm of the organization that works with government and enterprise customers needed a new brand purpose that resonated with their audience. The result was Motorola’s Moments that Matter. B2B marketing and sales might not be as exciting as B2C, but that doesn’t mean it has to be downright boring. At the end of the day, you’re still marketing to people. That’s why it’s important to keep people at the heart of your customer experience strategy. Let’s look at Jamf, a provider of software for both enterprises and smaller businesses that helps them manage their Apple devices, as an example. To connect with their customer base and provide a place for their customers to connect with each other, they created Jamf Nation as a place to connect with fellow IT professionals, gain insight about Apple device deployments, share best practices and bounce ideas off each other. In other words, building a community = building a brand. Customers dishing out negative feedback isn’t always a bad thing – as long as you know how to use that feedback. Incoming support requests and calls might be frustrating but this is your opportunity to hear what your customers are saying, take it to heart, and find a solution that fixes their problem. That’s a huge opportunity that can turn a negative situation into a positive outcome. That’s the approach Paycor takes as a provider of recruiting, human resources, and payroll solutions through an integrated, cloud-based platform. Their HR Center of Excellence provides a unique experience that empowers their clients to drive HR success within their own organization. Sensei Marketing has helped create and implement dozens of successful B2B Marketing campaigns across North America that improve the experience for our clients’ customers. Get in touch today to learn how we can help you too.